New Wave: Who’ll Stop The Rain? Untold secrets fester in the dark like starlets longing for the spotlight. Sooner or later, they burst onstage. In the newly released volume of my eco-fantasy trilogy “The Greening, Book Two: In The Wave,” Shiloh Carter’s life falls apart when a secret she thought she had carefully stowed away erupts like a rudely awakened volcano. For the last twelve years, since the birth of her daughter Eva, Shiloh has carefully maintained a facade of normality, pretending to be an ordinary single mom forced to travel a lot for her job. Eva has no idea what her mother does for a living. She only knows she’s not around much. But one thing Eva has believed all her short life is that her father died before she was born. Her mother told her so. Twelve is such a dangerous age, the pivotal point when a child turns toward being an adult. They begin to question authority and experiment with all manner of things; with luck, they get through it and emerge into adulthood some years later. Not all kids are lucky. Eva Carter has never seen a traffic jam. Born right after The Greening destroyed Earth’s oil supply, Eva hasn’t seen much of the world outside Washington, D.C.. However when Eva learns that her mother has been lying to her for years, she runs away and is soon swept up in a world where magic and mystery blur the lines between what is real and what is right. Eva doesn’t know that her mother has spent the last twelve years fighting a lonely losing battle to stem the spread of Deep Magic on Earth. But the job gets a lot more complicated after Shiloh realizes her own daughter has magic genes in her blood. While Shiloh struggles to find her daughter and regain her trust, Eva learns things about her own past that completely alter her ideas about the future. But when she risks everything using power she doesn’t fully understand, Eva draws the attention of Higher Powers who intervene to wash out the contagion, forcing all humanity to flee to higher ground. 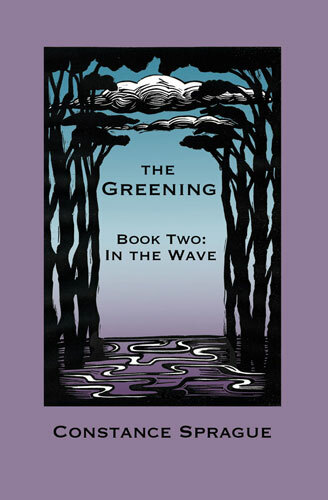 “The Greening, Book Two: In The Wave” is available in paperback now from Amazon. It will be available on Kindle soon. In addition, there is a Goodreads giveaway going on now through October 28th. Enter to win a free copy of the paperback.